Can my new windows be installed in the winter? Lakeview Windows & Siding’s crews work all year long when many remodeling companies lay off workers ot completely shut down during the winter months. Winter is an excellent time to fully appreciate the incredible value of new Lakeview replacement windows. The performance can be instantly recognized and the install is relatively painless. You are here: Home / Q&A with the Window Pros / Can my new windows be installed in the winter? 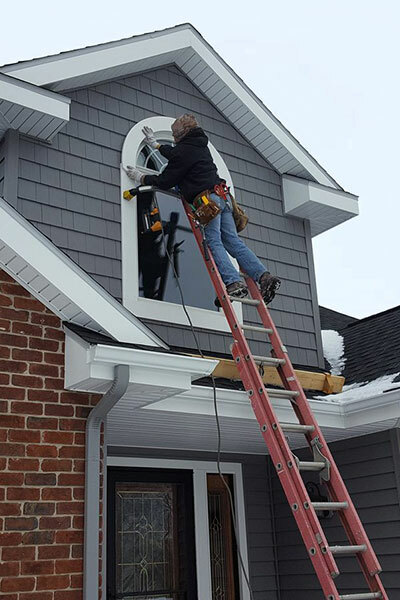 Lakeview Windows & Siding’s crews work all year long when many remodeling companies lay off workers or completely shut down during the winter months. Winter is an excellent time to fully appreciate the incredible value of new Lakeview replacement windows. The performance can be instantly recognized and the install is relatively painless. That’s right, painless! Although it is still remodeling, our systems allow us to work efficiently in the cold and slop. All the exterior trim and custom break work is laid out and bent up in our enclosed work trailer. The crew’s head installer does all the interior work using some simple courtesy steps. For example, he removes his shoes and lays a drop cloth in the area he is working, and he closes the door to each room (if possible) when the old window is being extracted and the new window inserted. Only one window is removed and replaced at a time with an average 3-5 minutes between removal and replacement. Most of the installer’s time is spent insulating, sealing, and trimming the new window after it is placed. Don’t let winter stop you from having a new windows installed in your home! It could be the best time to see how replacement windows from Lakeview Windows & Siding, LLC keep your home warm and cozy while it’s freezing outside. Call Lakeview Windows & Siding, LLC at (269) 963-1200 or stop by our showroom at 490 Marshall Street, Coldwater, MI, in the Fairfield Plaza across from Hungry Howies.